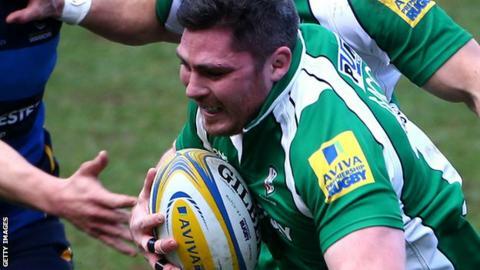 London Irish number eight Rob McCusker believes confidence can flourish among his team-mates after their crucial Premiership victory against Worcester. Wales international McCusker, 30, has impressed in the back row since a return from injury last month. Eleventh-placed Irish face Northampton on Saturday, looking for a first Premiership away win in almost a year. "We'll be keen to stay in touch with them as much as possible," McCusker told BBC Radio Berkshire. Irish sit level on points with fellow strugglers Newcastle ahead of the trip to Franklin's Gardens and will be keen to maintain the momentum of their recent home form. "We've had some games recently where we've been in it or just behind at half-time," said McCusker. "But in the second half we've had games where we've just capitulated and been a totally different team. "If we let Northampton get too far ahead, they'll be buoyed by that." The former Scarlets captain left the Pro 12 club in September by mutual agreement as he joined Irish on an initial one-year deal. Capped six times by his country, McCusker admitted the decision was driven by a need to play more games. "I didn't really know how I'd ever leave," he said. "But circumstances changed and it wasn't the place I had fallen in love with. "So it made the decision a lot easier. It was probably the right time and felt like the right thing to do."